Dr. Dean Kyne has been teaching Introduction to Sociology, Disasters and Society, Environmental Sociology, GIS for Disaster Management, and GIS for Social Sciences since August 2015. 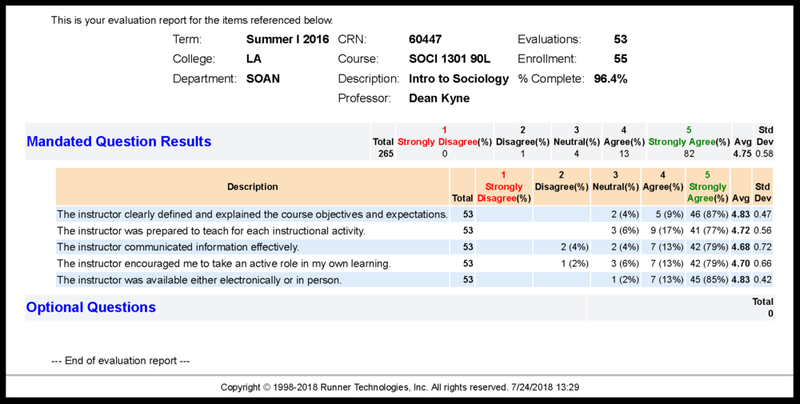 The followings are the official course evaluation reports for the courses Dr. Kyne has taught for the past years. Dr. Dean Kyne's teaching evaluation is rated as "4. Exceeds Expectations", the highest rating according to the Departmental Guidelines. Exceed Expectations: Candidate scores an average of 4.5 (90%) or greater on the 5.0 Overall Rating scale of the student teaching evaluations over the reviewed year.